I am still getting my fine motor skills back after my breast cancer treatment, with almost a full year off. Sewing and painting have been on my list of skills I want to rebuild and maintain. 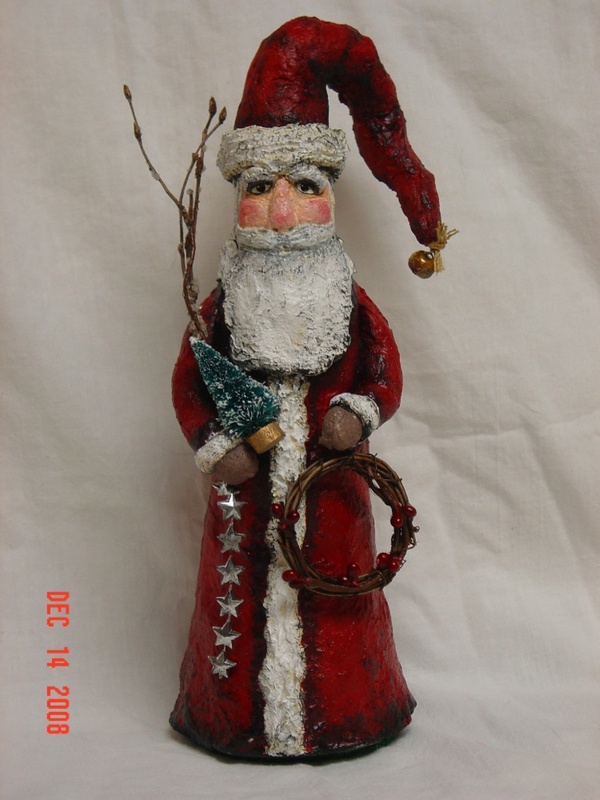 Usually I make LOTS of Santas for my Etsy shop at this time of year, including from paper mache, but as I said, I'm still coming back. 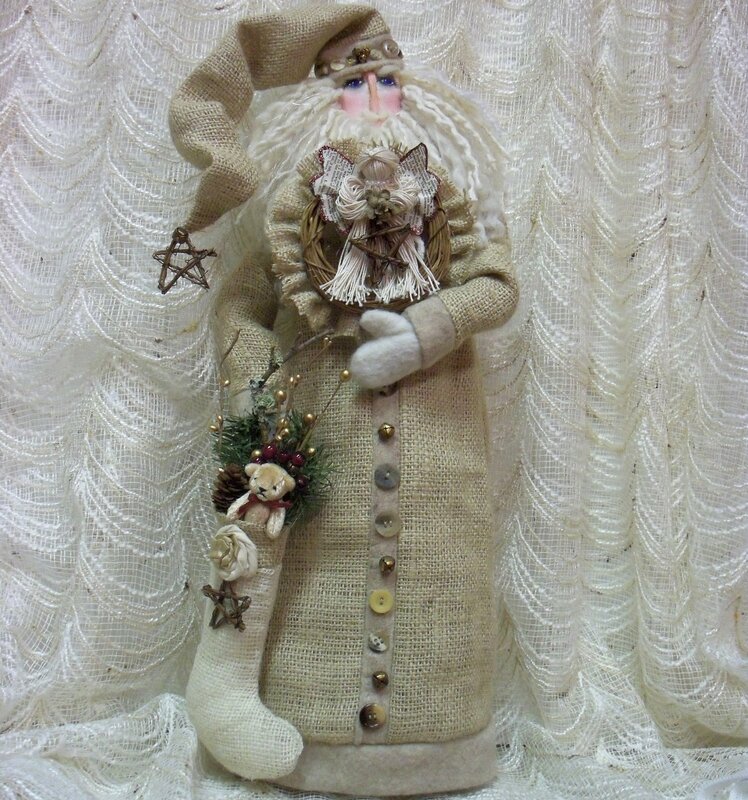 That said, I am REALLY pleased with this primitive Santa Claus doll with an outfit and accessories made of burlap. Once I painted his face I knew he was a "go." He is my doll #921 and he made me smile. 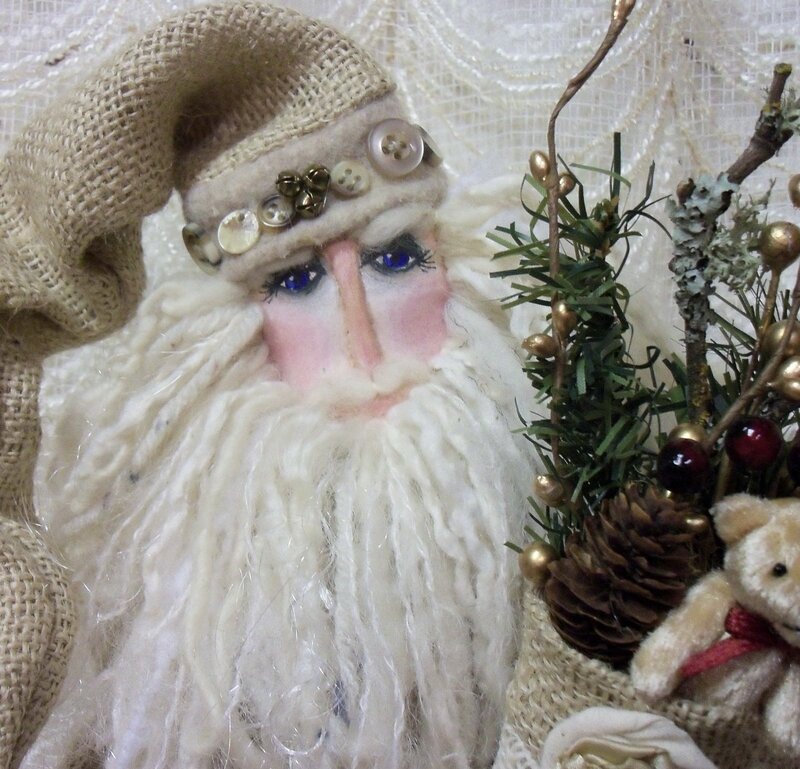 Of all the dolls I make, my Santas are my favorites! He stands 20" tall and I had a great time putting all the details together. 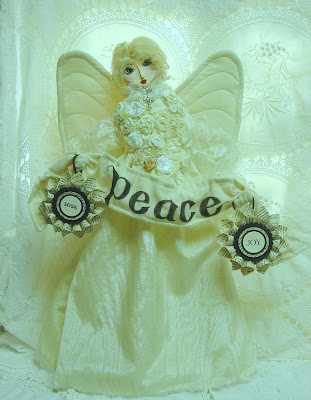 I added burlap ruffles to a twig wreath and added one of my string angels and a tiny twig star. They are perfect together! The jointed teddy bear in the stocking is golden plush and a tiny beauty. I buy them whenever I see them, they are the perfect size for my dolls. The stocking is white burlap trimmed with tan furry felt. With his wired arms this Santa is totally poseable and he can hold small items. His hat is wired, too, so it can be twisted and turned. Evidently a Santa in a burlap outfit is NOT a nutty idea, since this handsome guy sold in my Etsy shop in about a week! 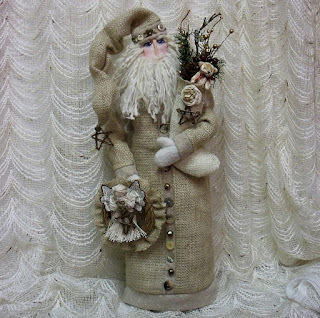 Really, burlap, who knew? I wish Christmas wasn't so close upon us because I'd make more of this style Santa if I had time. 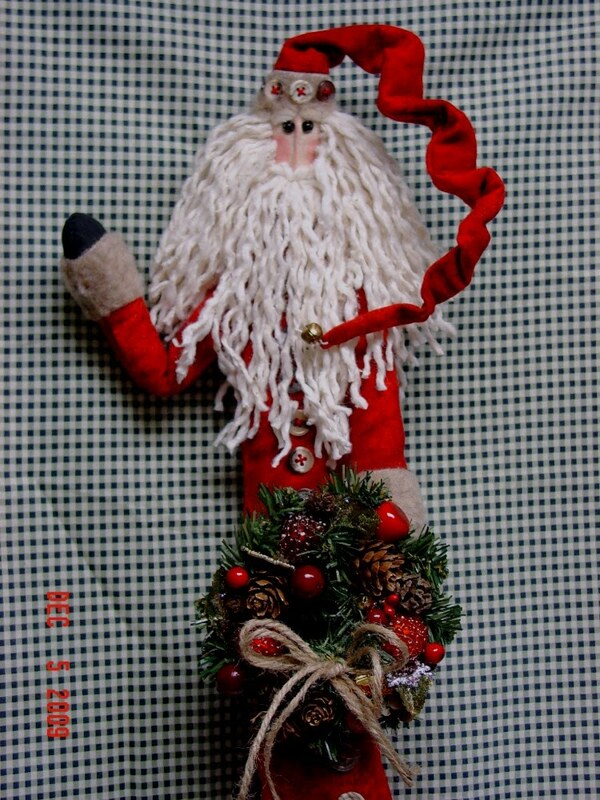 Perhaps I'll make one for practice and inventory and if he doesn't sell, well, he would look GREAT with my holiday decorations! I'll call that the plan, that's the ticket. 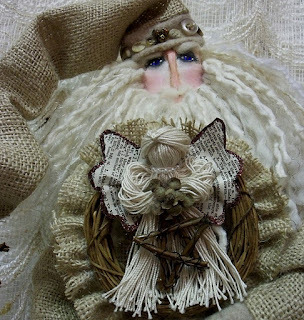 Thanks for checking my burlap Santa out. The world is a wide and interesting place, you never know which idea will please somebody out there. All of my dolls are unique; my own original designs handcrafted in my Oregon studio. They are all signed and numbered and these dolls are all SOLD. 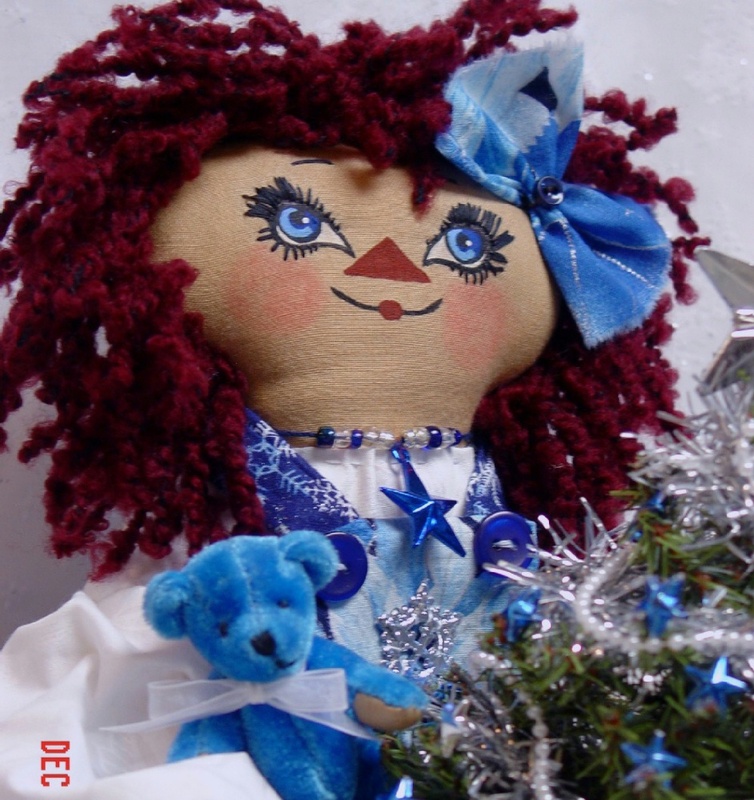 I've just listed doll # 950 in my Etsy shop. Take a look and see the wide creative variety of dolls made by me, Alexa Ann. 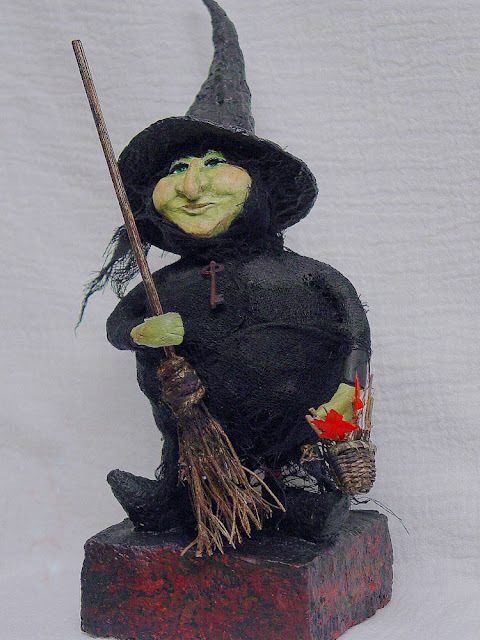 My series of round little paper clay witches are very popular. 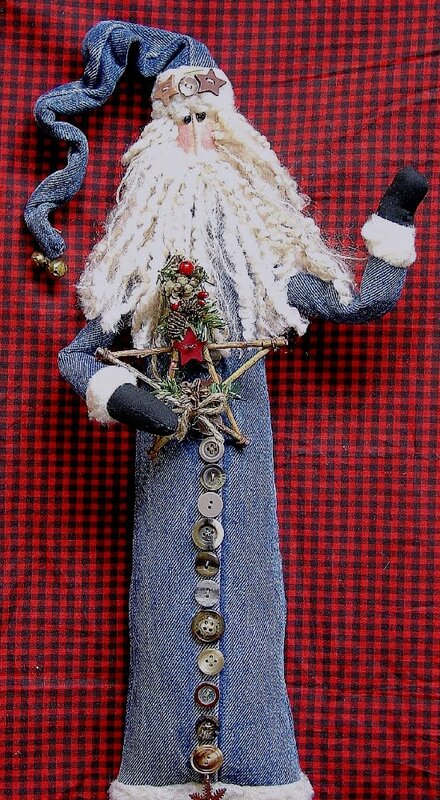 I use quilt pieces and scraps, many of them vintage for my Santa dolls especially. 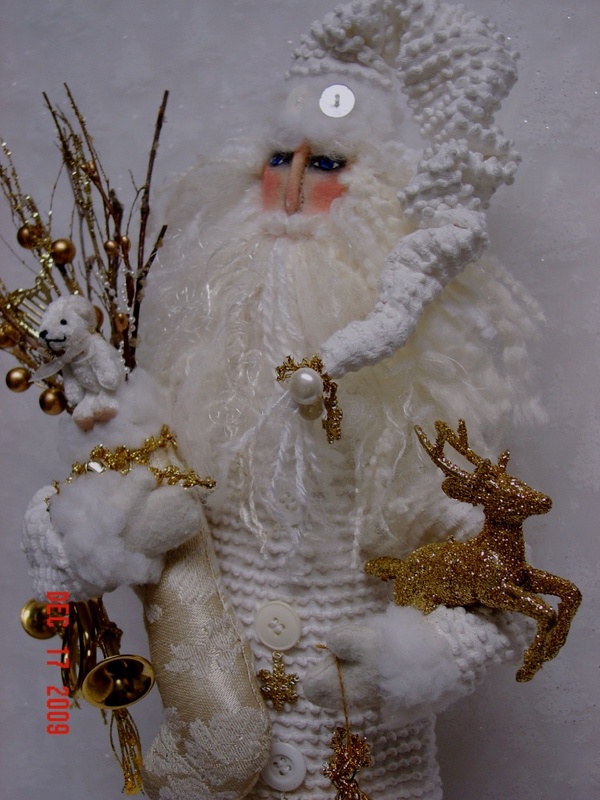 Valentine's Day Santas are great gifts for a Santa collector. Just a little dark goth angel Annie who popped into my head. Love her! 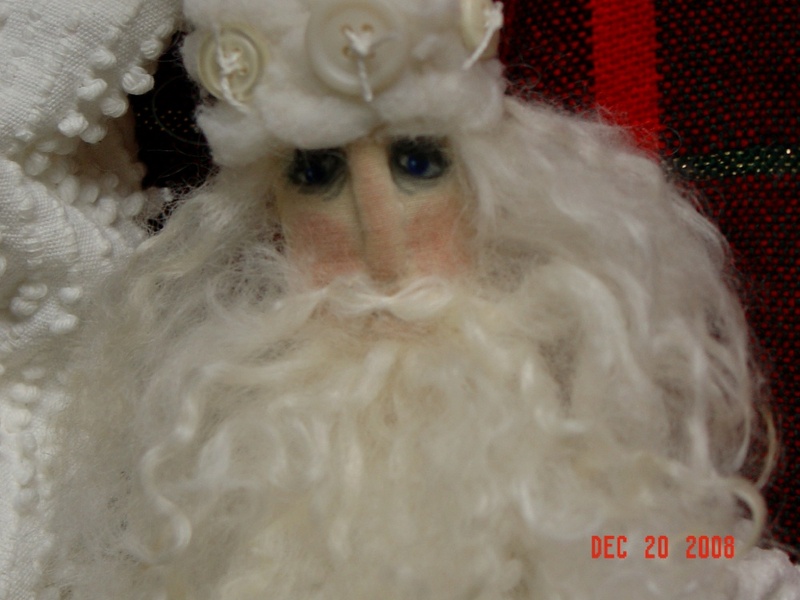 A little tabletop paperclay Santa, one of my first. 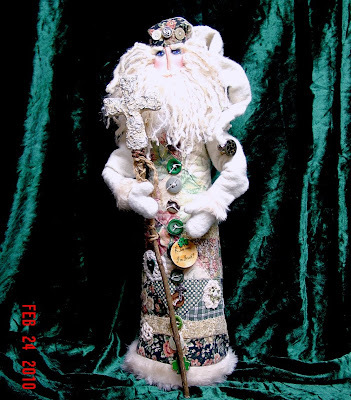 And another Irish Santa with a little different look. 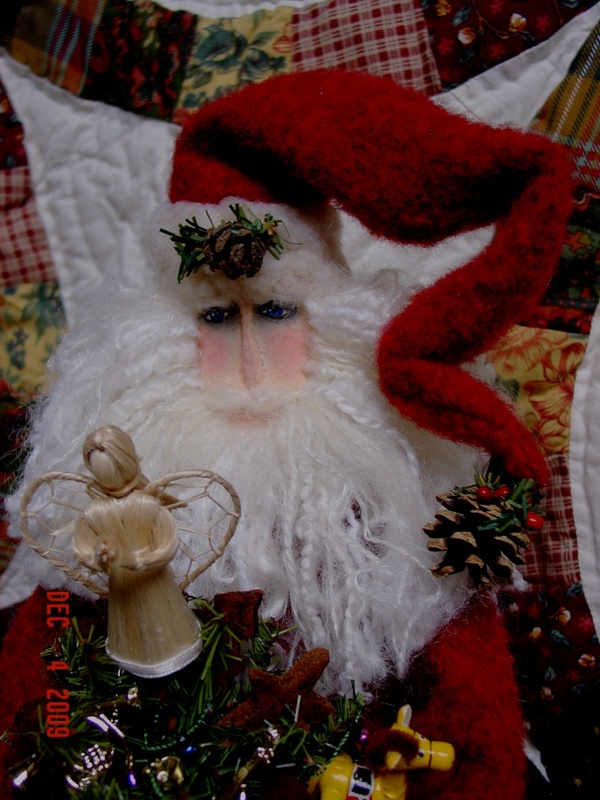 I love vintage chenille bedspreads and they make such distinctive looking Santa outfits. Just gorgeous! If I can't find a red and white quilt piece, I can make one! Do you have questions or comments or would like to order a themed collectible doll? Just email me at makethebestofthings@gmail.com. 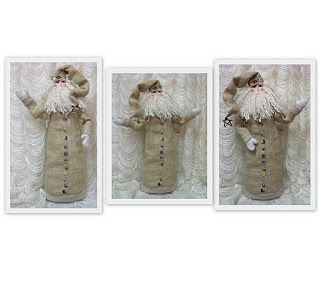 I've listed these two Folk Art Santas in my Etsy shop this week. They were sure fun to make! 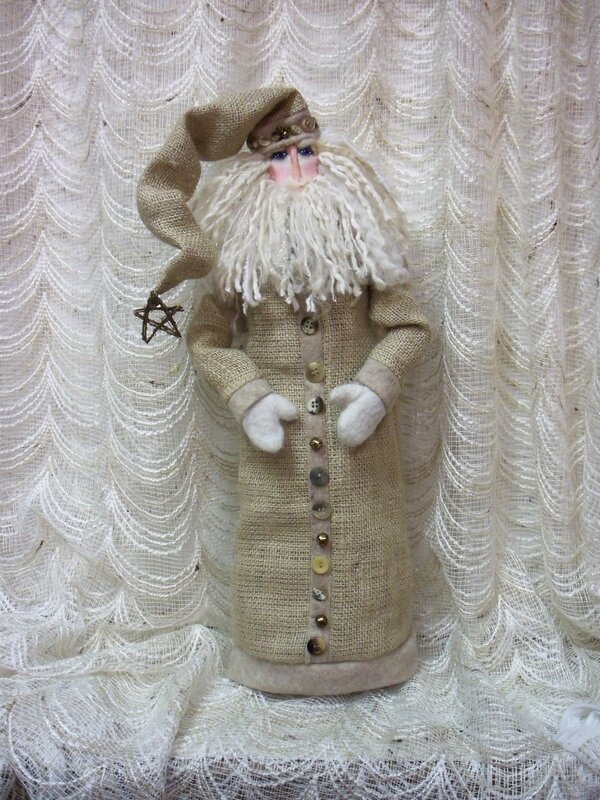 This Irish Santa is based on the worn, vintage style quilt in shades of green, tan, beige and cream and he's just loaded with fun details. Once I've made the doll and painted the eyes to my satisfaction, I go to town on his outfit. 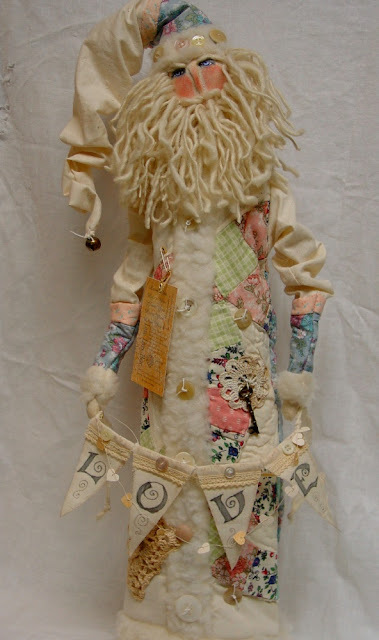 When people ask me where I get the ideas for my dolls I would have to say the robes come first. Just like making an outfit for myself, I see the quilt piece or unique fabric and I know what it will look like when I'm done. 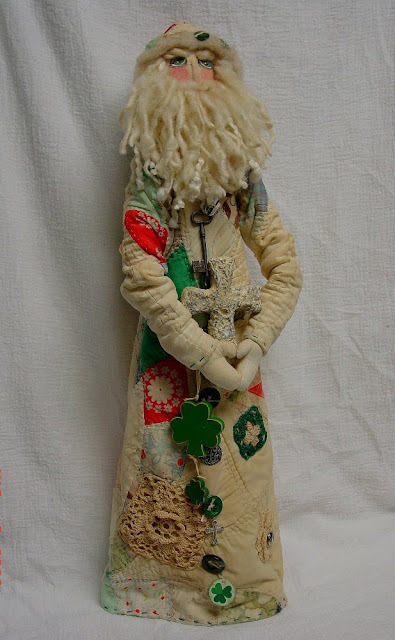 This old quilt piece was perfect for embellishment with Irish crochet roses, lace, celtic buttons and more. I love making the accessories, too, individually styled for each doll. This stocking is made from green tapestry with old lace and a cinnamon star and it is stuffed full with twigs, berries, a glittery shamrock and cinnamon sticks. 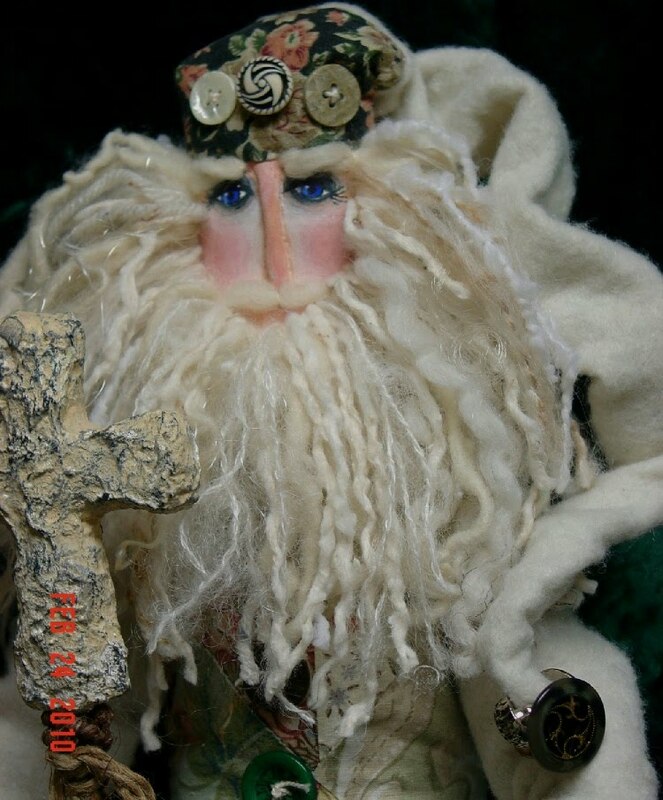 Since my Santa's arms are wired, he can hold his stocking and his Celtic cross staff very nicely. 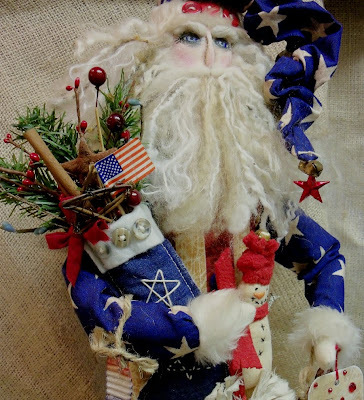 Look at the fierce blue eyes on this Americana Santa! He has the look of an old fashioned civil war general, I think. 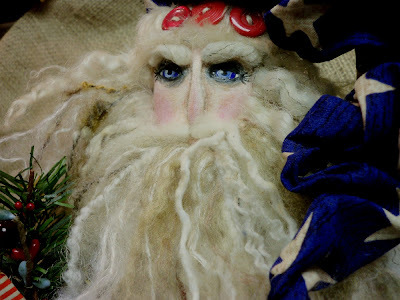 I just love the way my Santa fellas come out, they are so compelling to me now that I've figured out just the way I want their eyes to look, then everything else falls into place. The vintage print fabric is perfect for this good looking guy. 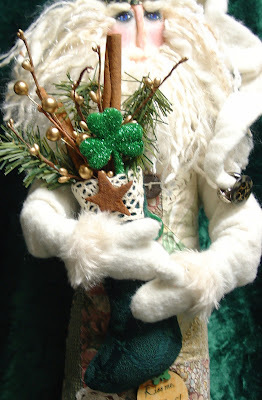 I also loaded him up with fun details and accessories, including an embroidered stocking and hand made muslin snowman. 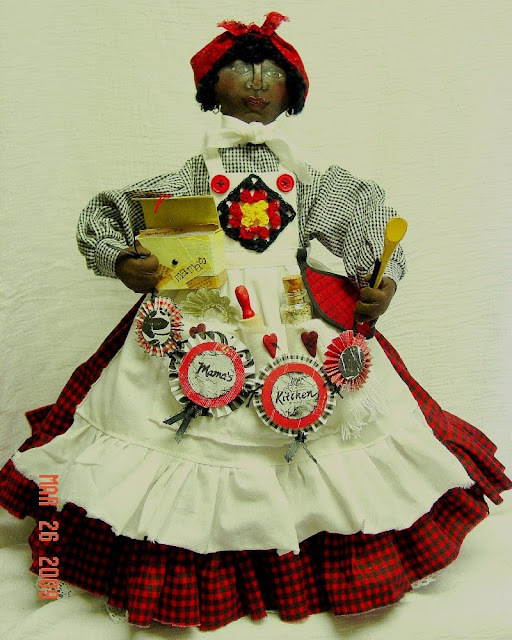 For your Americana decor or for that special someone returning from military duty, this doll would be a wonderful family gift and heirloom! Just look at him so tall and straight, and his arms are wired so he can be posed in multiple ways. 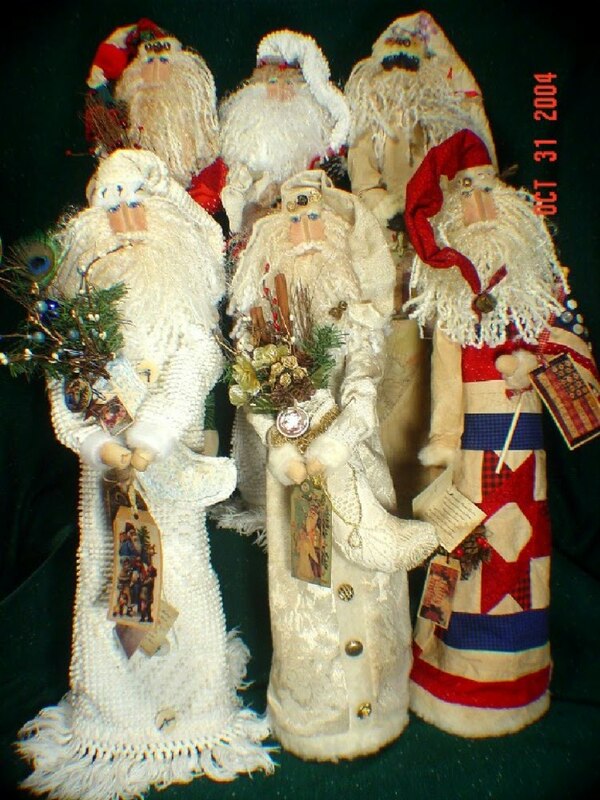 Sigh, I just love my Santa dolls. Wish I could keep them all! I often wonder just what could they be thinking every time I finish a doll. Sometimes they look sad, or quizzical or serene or serious and thoughtful. I never know until I put that final little twinkle in their eye and call them done. These two fun, collectible Santa dolls are no exception. They look vintage and old but are brand new for us, my own original designs from my Oregon studio. Don't miss them! 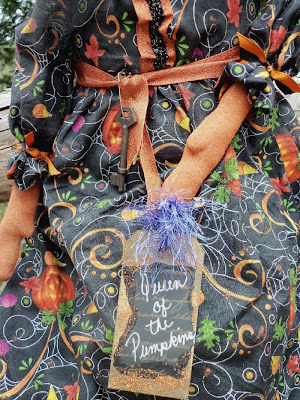 Here she is, the Queen of the Pumpkins, my gift from Candace Navarette at Howling Moons Designs for the Rabbit Hollow Prims Halloween swap. Isn't she marvelous? I like her. I like her alot! What a face this doll has! 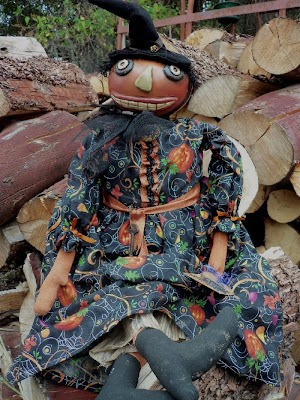 Candace used the fat end of a gourd for this marvelous doll and paperclay for the primitive folk art features. So creative and clever! See the tiny gold colored rose earring she has to trim her hat? Notice the black fun fur for hair? And she smells oh so good, like apples and cinnamon! The Queen's dress looks like vintage fabric, as do her striped pantaloons. 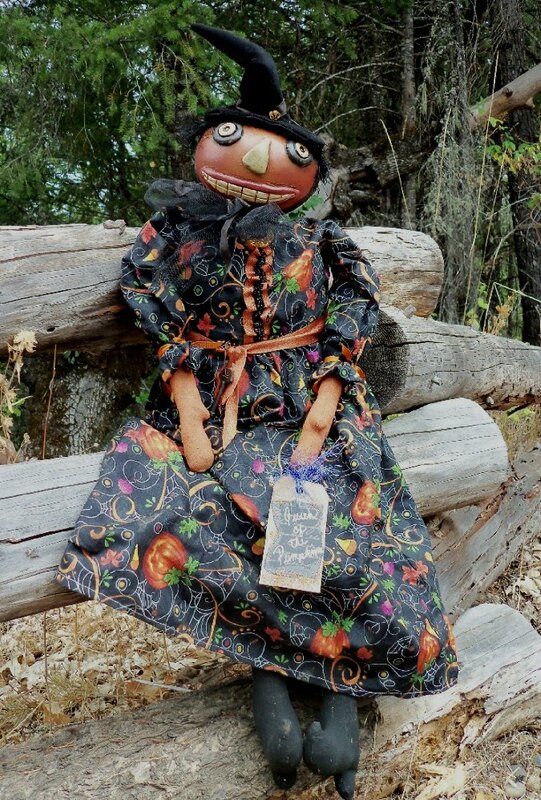 The glittery orange and black ribbon trimming her dress is perfect for this doll, and don't overlook the netting and crinkly ribbon bow at her neck. 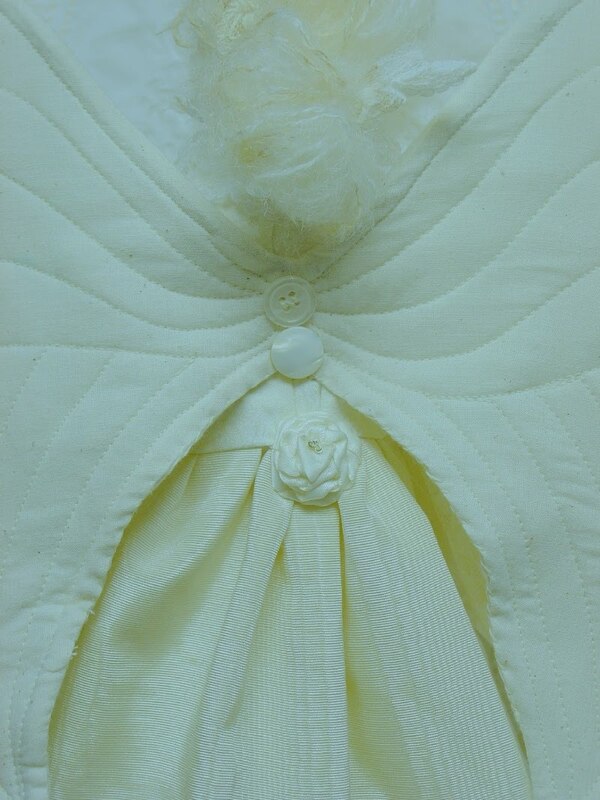 And just peaking out is a big gold and black button on her dress. A rusty safety pin holds a vintage skeleton key at her sash, and her arms and legs are painted orange osnaburg. Her high heeled boots are also painted. The glittery tag says it all...she truly is the Queen of the pumpkins! She really likes to sit on our woodpile and our log fence. She seems very comfortable and looks regal perched in either place. What a marvelous, wonderful piece of art she is! Thanks, Candace, for making her and sending her my way! And thanks to Sue, Cindy and Kim at Rabbit Hollow Prims for inviting me to this fun party. When's the next one? Can't hardly wait! Here's a link to Candace's blog post about my gift to her for this swap. 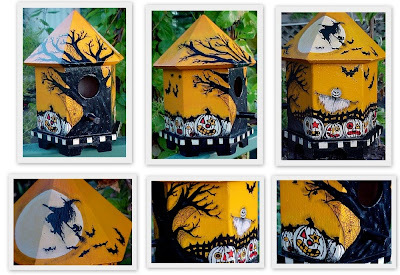 And here's a link to the gallery at Rabbit Hollow Prims of the other great Halloween pieces in this swap. Go check it out, you'll love what you see! The Raven's Tea Party...my first Halloween Swap piece. I was invited to participate in a Halloween Art Swap by Rabbit Hollow Primitives and this is my folk art piece, the Raven's Tea Party. Man, what a blast I had making this project! 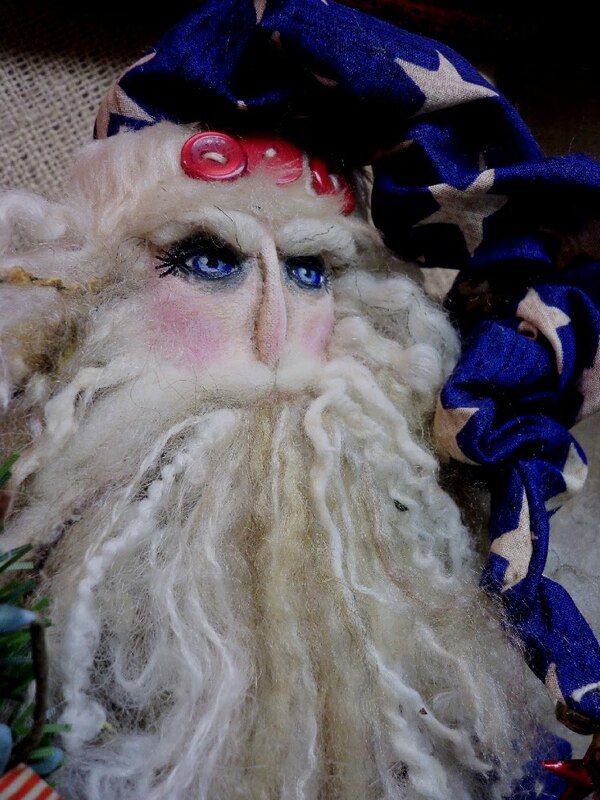 My partner is Howling Moon Designs, and she's already posted it on her blog. And by the way, she's got some wonderful creative stuff on her site, you should check it out! I knew I wanted to build this piece around a raven holding a tea bag, and when I spied this candleholder in my stash, I knew I was on the right track. 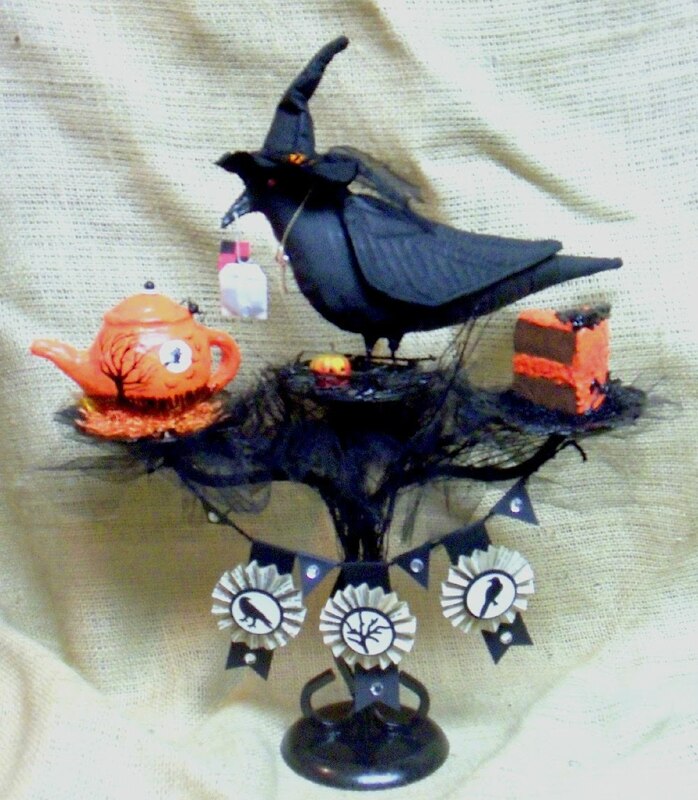 After painting it, I wrapped it in bundled twigs, draped gathered tulle between all three branches and added doilies to the side holders. 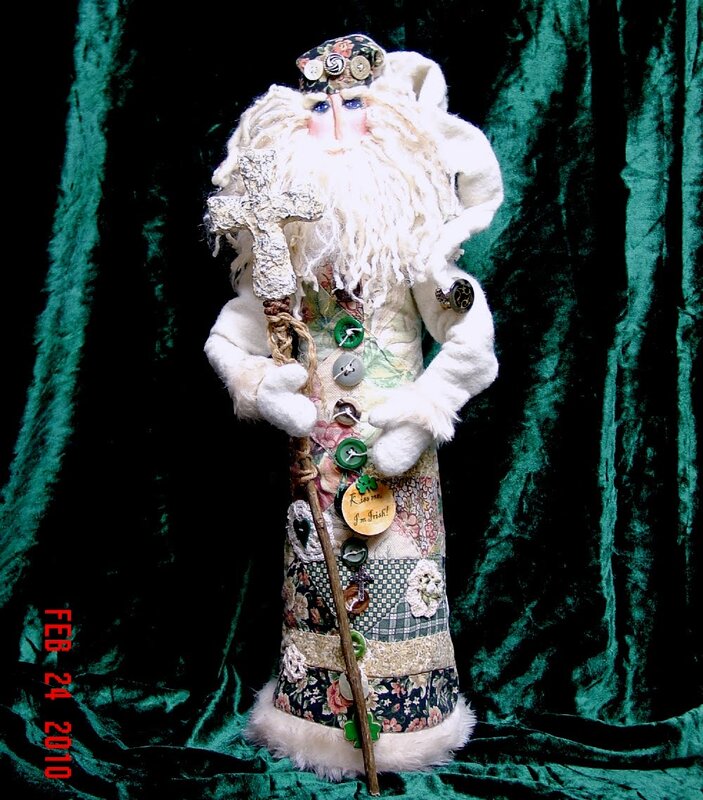 I made the raven of muslin and paperclay with wire feet and quilted wings sewn on separately with a tea bag dangling from it's beak and a witchy hat on it's head. It is also wearing a tiny skeleton key around it's neck. The tea pot is styrofoam and paperclay and painted with acrylics. The spider is wire and beads. 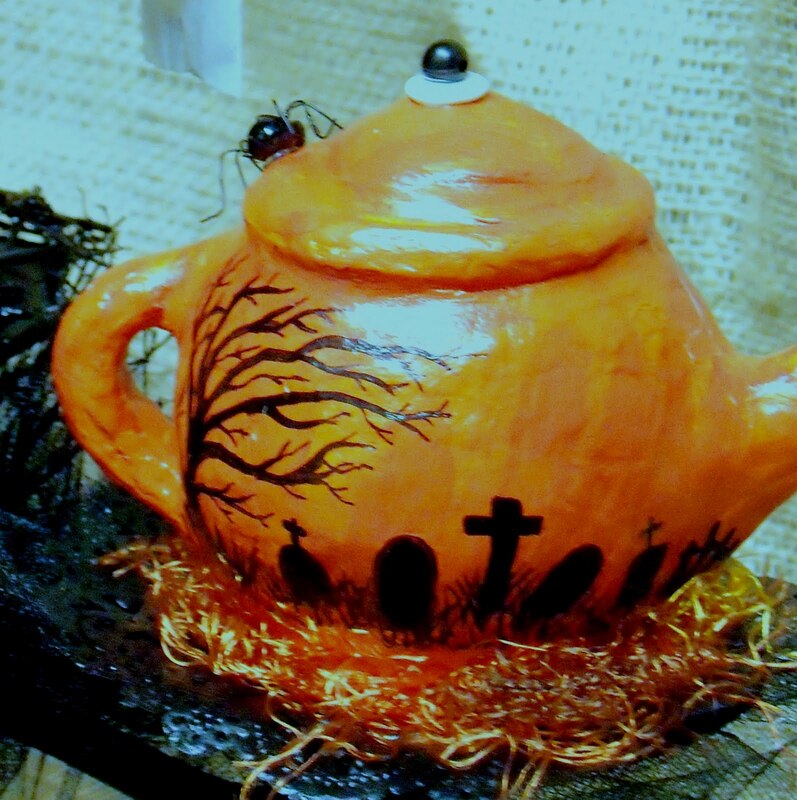 I added fun yarn around the teapot's base. The twig nest around the raven's feet also holds a teeny tiny jack o' lantern I carved from a pumpkin less than an inch across. X acto knife, baby!! 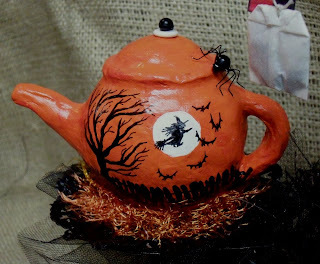 I painted a scary tree with a crooked fence and a witchy moon with bats on the front side of the teapot, and on the back there's another scary tree in a an old graveyard. 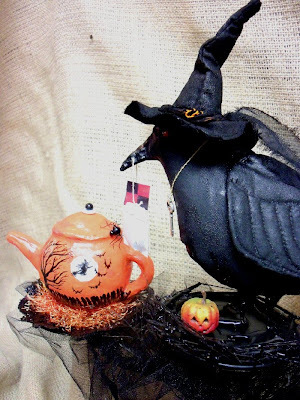 Very spooky and perfect for a Halloween tea party. And what's a tea party without cake? 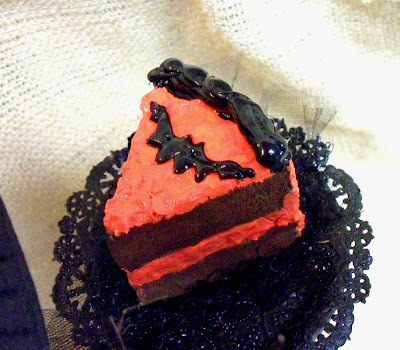 I started with a wedge of styrofoam and some paperclay, then added the dimensional bat and piping with hot glue which I painted to look like ooky black icing. Acrylics made it look like chocolate cake with orange frosting, just perfect. I LOVE the way this piece of cake came out! As the finishing touch I added this mini garland made by my daughter. 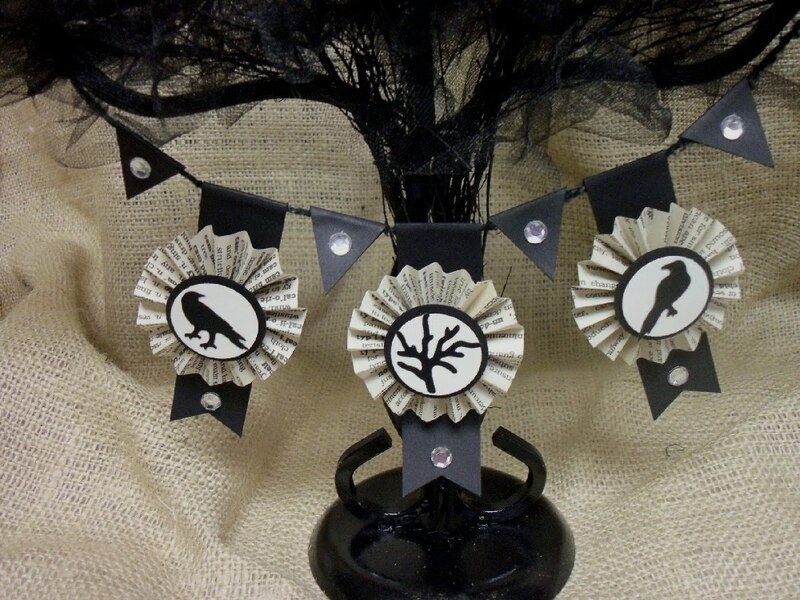 The rosettes are made of book paper and the stickers are from Martha Stewart's Halloween collection. She is a clever one, my daughter! Candace at Howling Moon Designs says she loves her gift and I loved making it for her. 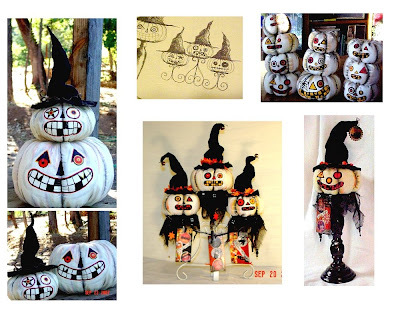 I see that she is a member of Eclectic Halloween Artists Group, which I would love to join. Guess I'll have to start campaigning for that honor. 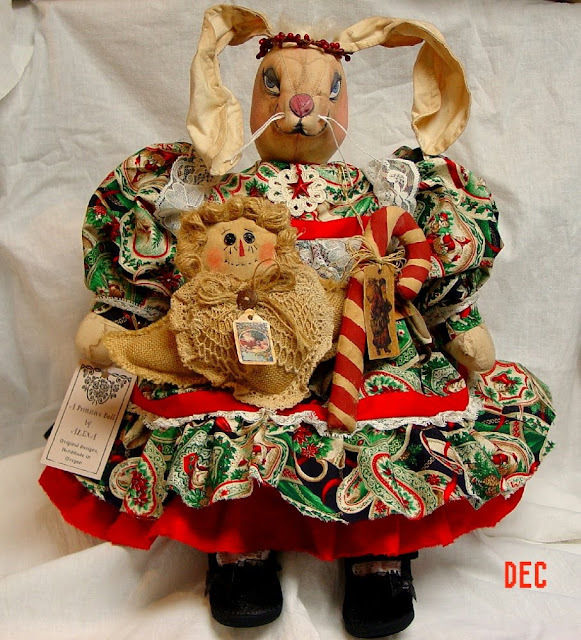 Rabbit Hollow Primitives has posted all the swap projects on her site, go take a look. There is a wonderful collection of beautiful creations on her site, you'll be glad you visited. 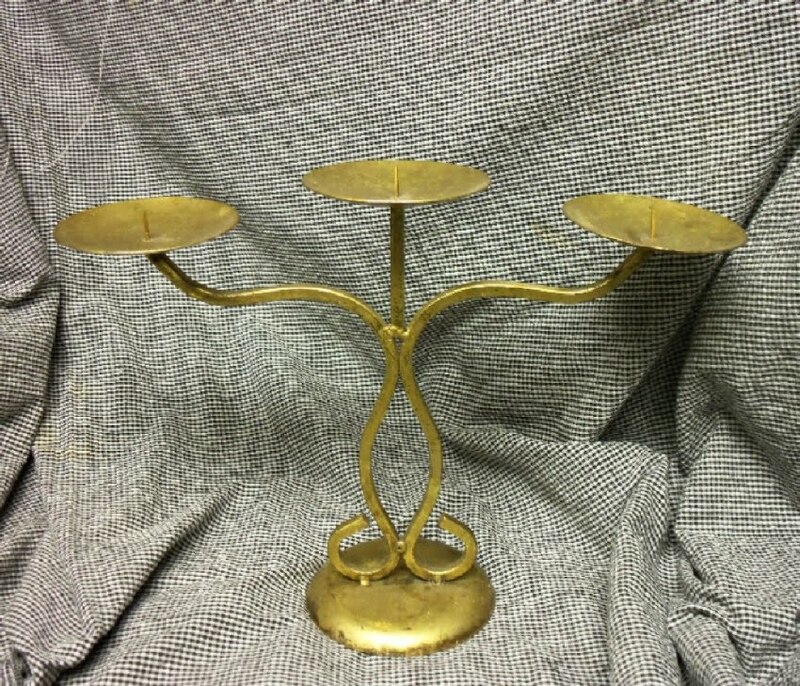 And guess what, I have another candleholder just like the one I used for this project, so I can make another Raven tea party if I want. I love it when a plan comes together! I love the holidays and the fact that Halloween comes up first gets my creative fires burning bright. 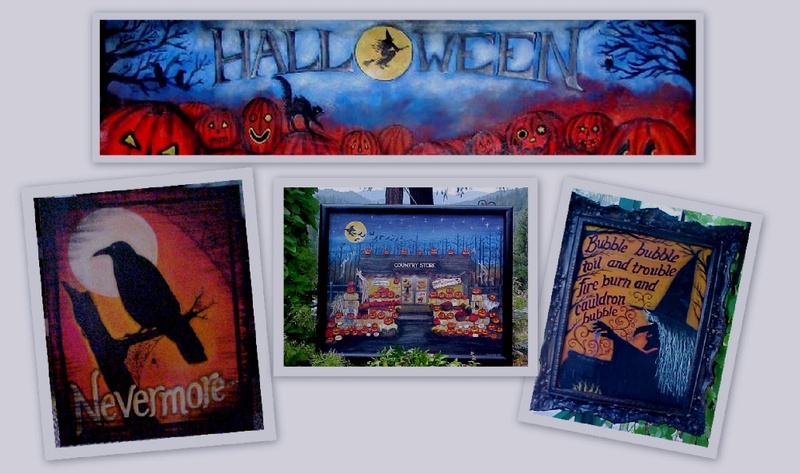 I love the "anything goes" aspect of making things for Halloween and so, in my usual style, I try lots of different things for my house and also to sell on Ebay on Etsy, like the wide banner and paintings above. This year I plan to do a whole series of Shakespeare quote Halloween paintings or banners. And Edgar Allan Poe, that wonderfully creepy author. I wonder if Stephen King will reach that icon status in the next century? And sometimes I get an idea in my head and I just have to go for it! 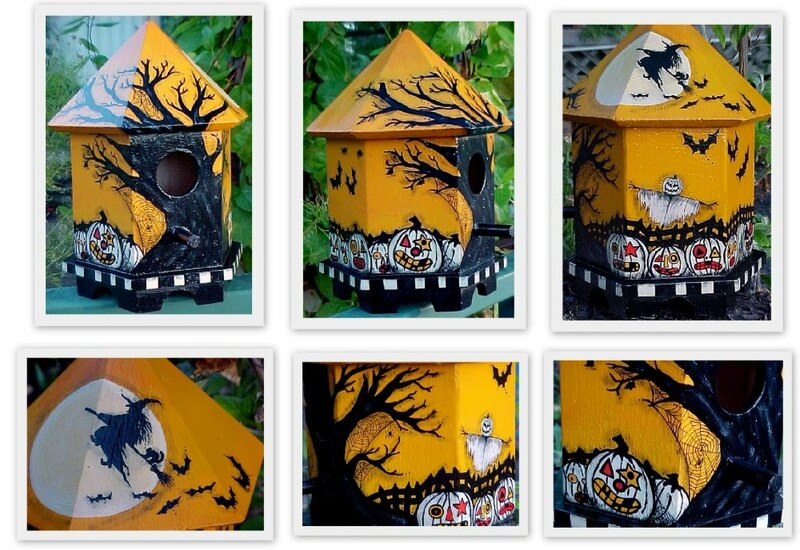 In this case it was a Halloween birdhouse with bright yellow and black. Love this! I'll probably do a few more! 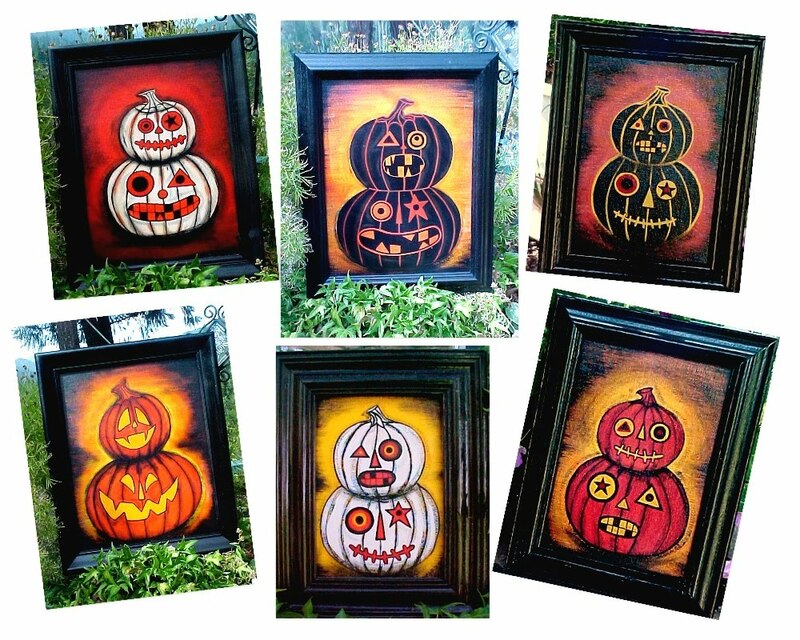 I love painting these vintage style Jack o' Lanterns and I still have this set for my home decor. I love the bright combo of colors so much I used them for my banners. And boy, do I love painting these banners. They are bright and colorful and fun! As you can see, a group of them hanging on my porch are traffic stoppers. 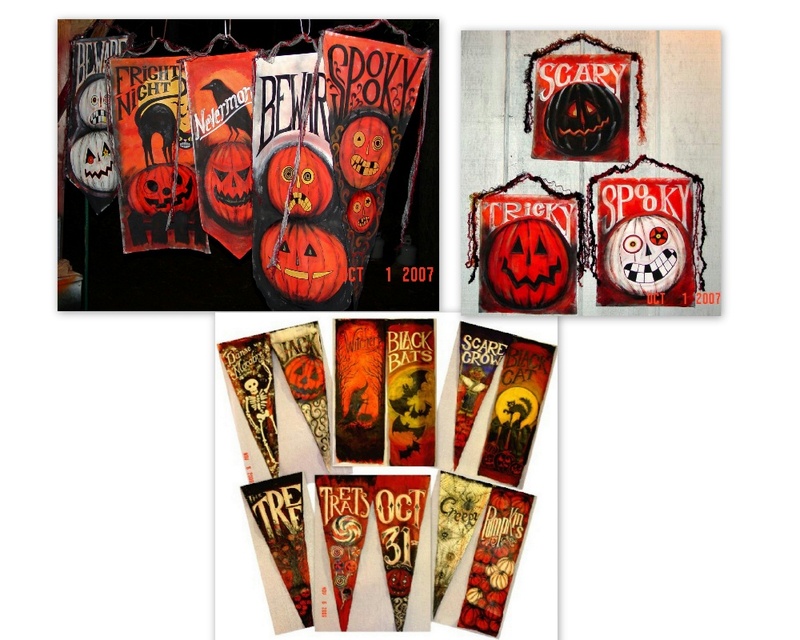 I've painted and sold dozens of these Halloween flags and plan to do many many more. I also like the vintage vibe of white Jack O' Lanterns. 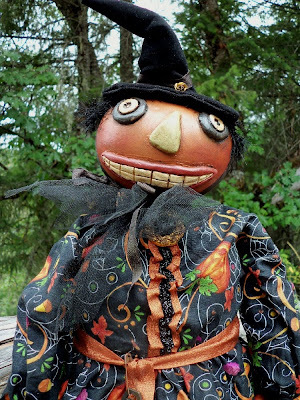 Made from muslin then stuffed and painted and embellished to a fare thee well, each year I make and sell lots of these fun pumpkins. I sketched an idea for candlestick JOLs and this year I'll be trying out some new configurations of these fun guys. The stacked set on the left is over 4 foot tall! 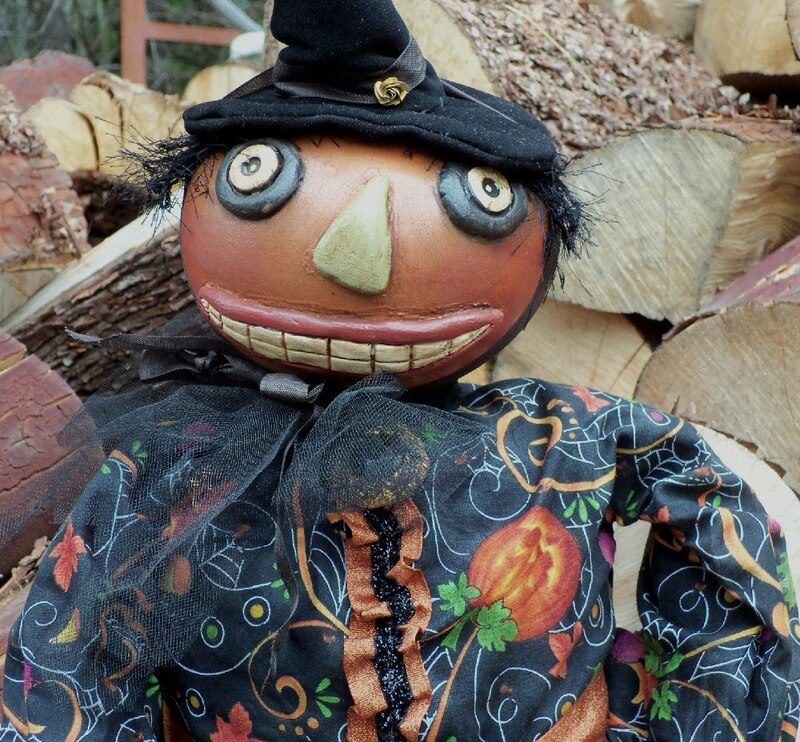 In the last couple of years I have discovered paper mache and I really love the possibilities for making cool Halloween characters. My roly-poly witch sisters came out so well, with such expressive faces, that I'll be making more of them this year. 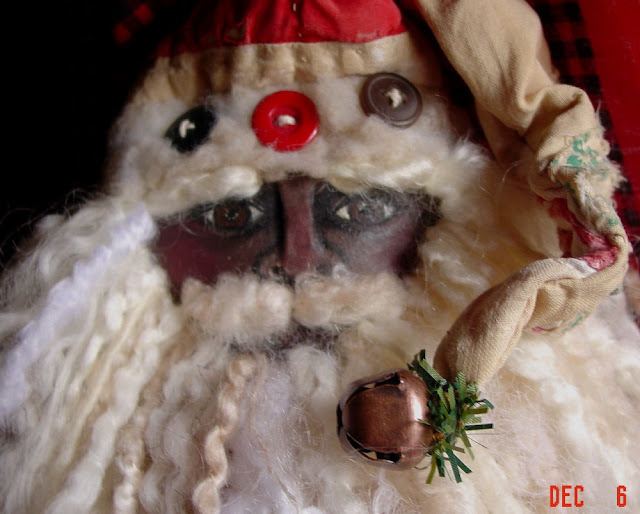 I started using paper mache for doll heads and for lots of Santa and snowman figures, too, so paper mache is my new craft love. 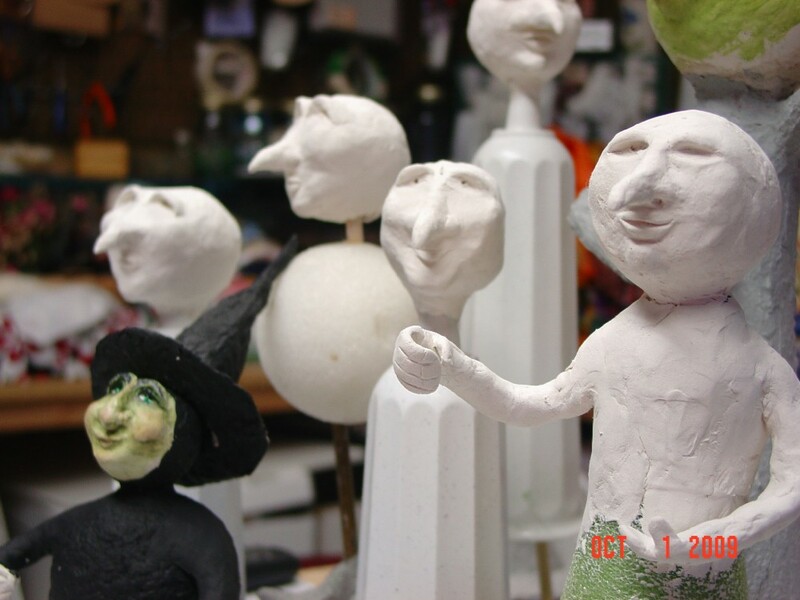 I've got a group of figures going right now, it will be interesting to see their personalities take shape! 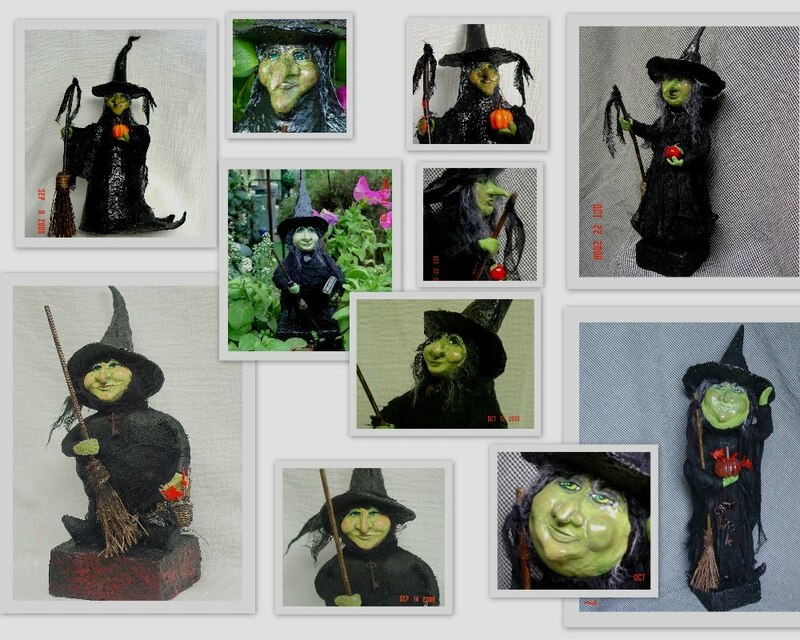 I've finished some of these witches and others are still in process. Halloween is coming and it's not too early to plan and sketch and design some fun new projects. I'll be posting some of those projects right here, so check back again, won't you? 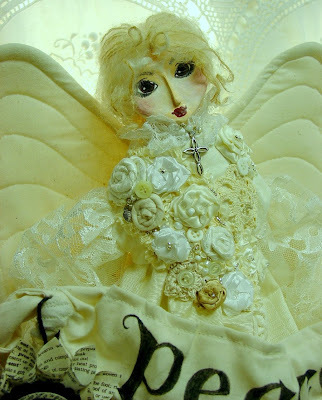 I've been busy this week making this pretty angel doll for a Lovejoy Hospice fundraising auction. 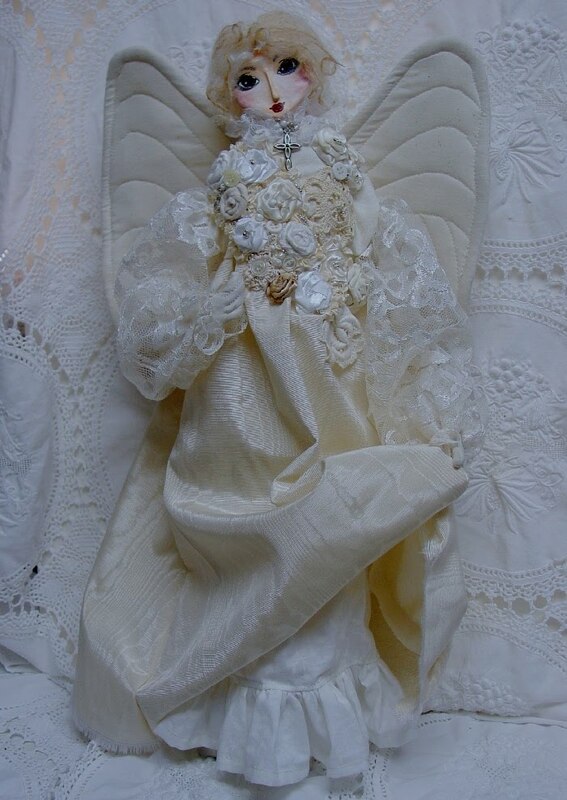 I upstyled my sitting angel doll into this standing beauty, and I truly love the way she came out! 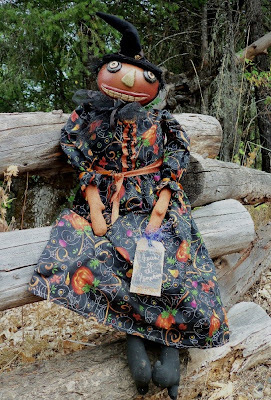 Thanks to my sister and hubs, who purchased this doll and are donating it to the auction for the Grants Pass, Oregon event. 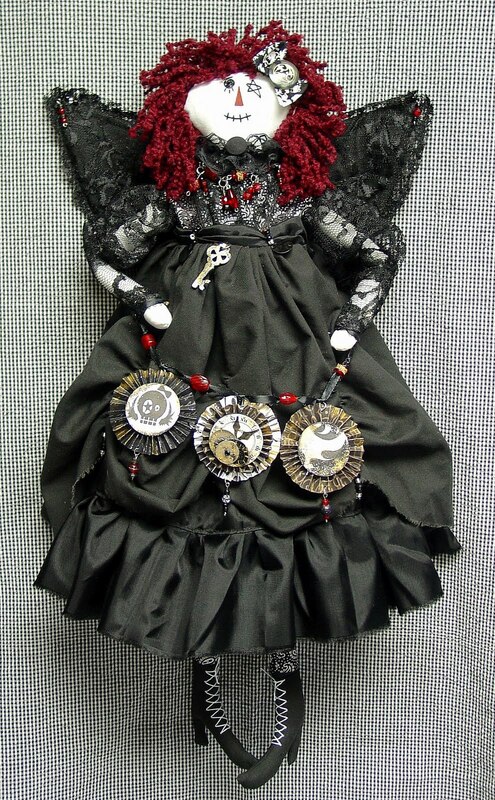 She is my own original design and is my doll #937 . She is signed and dated. 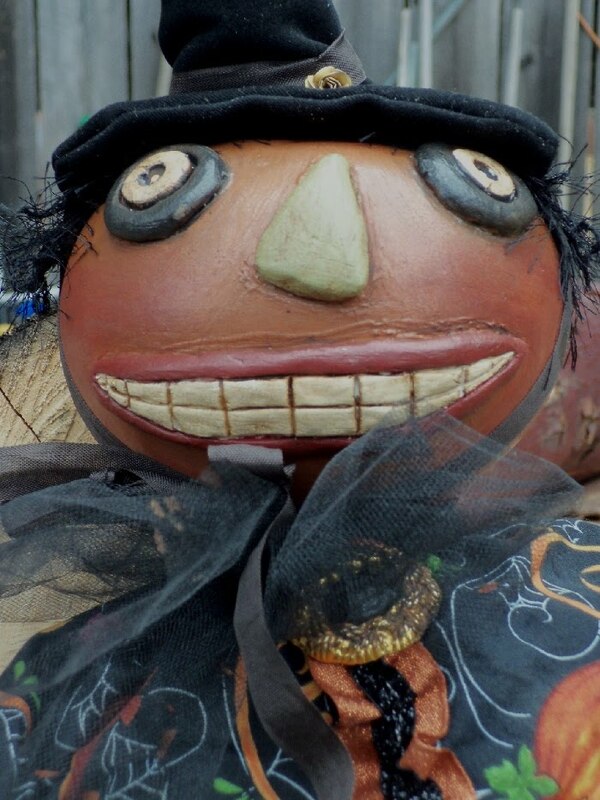 Her sweet face is paper mache, handpainted. And her hair is imported Italian mohair in a fat bun. I added a pretty beaded halo which is not shown in the pics. Her bodice is heavily embellished with my fabric and ribbon rosettes and crocheted flowers, plus buttons, beads, lace, charms and ribbon ruffles. I really went to town on the trims and I loved it! She stands nicely at 19" and her full skirt is moire (wood grain) satin. 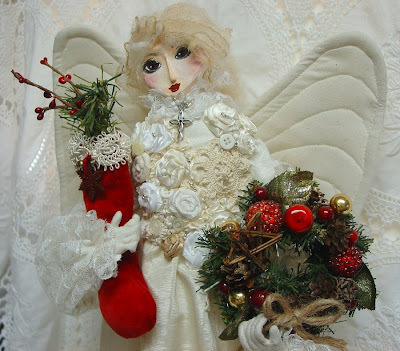 Her sleeves are ruffled lace and her hands and arms are wired. These are so cool! Christy centered them with discs saying "Love" and "Joy." This angel also comes with a wired muslin banner which says "Peace." 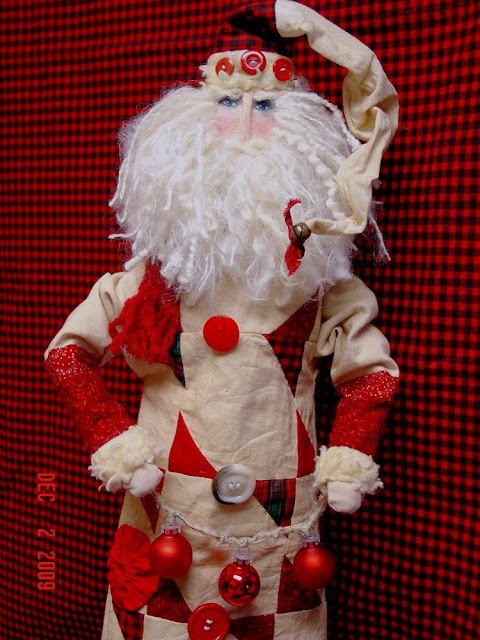 With her wired arms and hands she is poseable and can hold small objects. Here she shows off her pretty ruffled chemise under her dress. And just to add to the fun, I included one of my red velvet Christmas stockings and an embellished twig wreath. We're hoping she raises some great funding for the Hospice and she was so much fun to make I am going to make another for my Etsy shop! 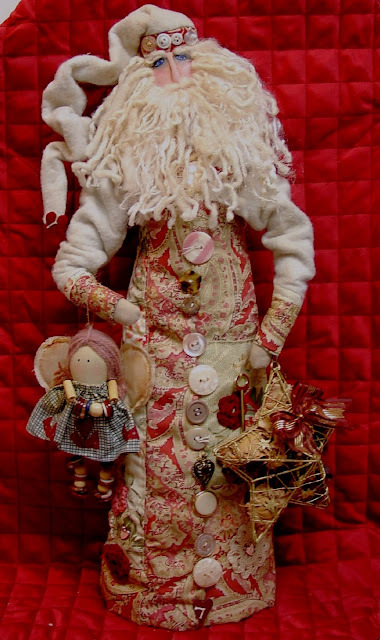 I'm also posting about her on my craft blog, Make the Best of Things, where I'll be joining some weekly blog parties. Come visit! I've always been creative and even my treatment and recovery from breast cancer has only slowed me down, not stopped me. At this time in my life I finally have my own craft studio where I can paint, sew, draw, crochet, design, quilt, you name it. I am creatively curious and I won't let my chemo stop me!